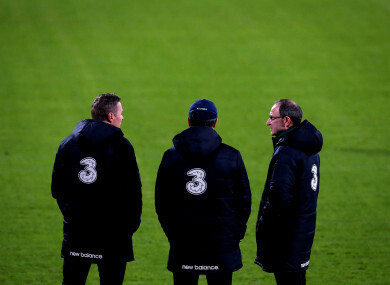 Last stand: Martin O'Neill with assistant manager Roy Keane and coach Steve Guppy in Aarhus. THE FAI ARE looking for a new senior manager this morning. The Association have confirmed that Martin O’Neill has left his position by mutual consent. Assistant manager Roy Keane also departs along with coaches Steve Guppy and Seamus McDonagh. Ireland won just once this year — a friendly victory over the USA — and have not scored a goal in over 397 minutes. The already-relegated Boys in Green rounded out a dismal Uefa Nations League campaign with a scoreless draw away to Denmark on Monday night. O’Neill oversaw qualification for Euro 2016 during his five-year term and can reflect on memorable victories over Italy and then-world champions Germany amongst other highlights. So, was the decision to part ways with O’Neill the right call? Email “Poll: The O'Neill-Keane era is over; was the decision the right call? ”. Feedback on “Poll: The O'Neill-Keane era is over; was the decision the right call? ”.